A teenage chicken is called a pullet (female) or cockerels (male). Backyard chickens are considered teenagers from 4 to 17 weeks of age. Feed a chick starter feed from day 1 through 18 weeks of age or when the first egg appears, at which time you can switch to a chicken layer feed. Our teenage years are pivotal, helping shape the rest of our lives. This “teenage stage” is also important for backyard chickens – playing a key role in a bird’s future. Many families enjoy teenage chickens after purchasing baby chicks at local Purina retailers. In a matter of a few weeks, chicks go from cute cotton balls to pin-feathered chickens adjusting to their long legs and new feathers. Backyard chickens are considered teenagers from 4 to 17 weeks of age. The teenage chicken stage isn’t talked about much in the backyard chicken world, but it’s a very important growth phase. These weeks are a lot of fun; they’re filled with quick growth, defined personalities and backyard exploration. Since exciting changes can be seen during this phase, there are often many questions. Here are three of the most common topics we receive questions about when it comes to teenage chickens. As birds develop, their gender becomes much more obvious. New primary feathers develop along with new names. Pullet is the term for a female teenage chicken, while a male teenage chicken is called a cockerel. Between 5-7 weeks, you should be able to begin visually distinguishing males from females. 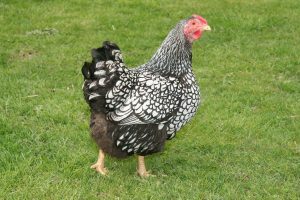 Compared to pullets, the combs and wattles of cockerels often develop earlier and are usually larger. Females are typically smaller in size than males. A female’s primary flight feathers on her wings are generally longer, but the developing tail feathers of males are bigger. If you are still uncertain of gender, you’ll be sure who the males are when you hear them attempting to crow. Keep chicks in the brooder box until week 6. As chicks grow in the brooder, keep birds comfortable by providing one to two square feet per bird. The temperature should be between 70 to 75 degrees Fahrenheit to help them get ready to move outside. Your chicks require less heat because they are now larger and can better regulate their body temperature. 2. Move brooder into the coop. 3. Release chicks into the coop with the brooder still available for an option. 4. Supervise chicks outside of the coop in small increments. 5. Keep young chicks separate from older birds until they reach the same size. Many new flock raisers this spring wonder about switching feeds as birds grow. Keep the feeding program similar from day 1 through week 18. Continue feeding a complete chick starter feed, such as Purina® Start & Grow® Non-Medicated or Purina® Start & Grow® Medicated, Purina® Organic Starter-Grower, or Purina® Flock Raiser®, through 18 weeks of age. Starter-grower feeds are higher in protein and lower in calcium than layer feeds. Look for a starter-grower feed with 18 percent protein and no more than 1.25 percent calcium for laying breeds. Meat birds and mixed flocks should be fed a diet containing at least 20 percent protein. Too much calcium can have a detrimental effect on growth, but a complete starter-grower feed has just the right balance for growing birds. The building blocks birds receive from their feed are put into growing feathers, muscle and bone. Prebiotic and probiotics support immune and digestive health, while added marigold extract promotes brightly colored beaks and leg shanks. Ideally, wait until birds are 18 weeks old before introducing treats and scratch. It is important that birds receive proper nutrition in early development. If you can’t wait to spoil your birds, then wait until the flock is at least 12 weeks old. Keep the treats and scratch to a minimum – no more than 10 percent of total daily intake from treats to maintain nutritional balance. Feeding growing birds is simple. After moving birds to the coop, continue feeding a complete starter-grower feed and complement with scratch for a treat. Then, watch your pullets and cockerels grow and change each day. -Courtesy of: Patrick Biggs, Ph.D. This entry was posted on Wednesday, March 20th, 2019 at 11:11 am	and is filed under articles, chickens, News & Updates. You can follow any responses to this entry through the RSS 2.0 feed. Both comments and pings are currently closed.